The club’s Treasure Chest has made a £200 donation to assist the North Ayr “Thegither” Project”. This project is led by Development/Family Worker Rosie Eggo and is an initiative of the North Ayr Parish Grouping which consists of Ayr St. Quivox Church, Ayr St. James Church, Newton Wallacetown Church and Lochside Church. The aim is that the churches will come together to serve the North Ayr community through a range of outreach projects. Rosie hails from Ayr and has a degree in Youth and Community Work with applied Theology and also a Post Graduate Diploma in Community Learning and Development. She is excited to be involved in the North Ayr TheGither project which she says has many opportunities to reach out to the local community, to work “thegither” and to share the gospel. Example initiatives include volunteers helping with school homework, teaching crafts and simple home-keeping skills. The Rotary Treasure Chest donation is specifically to help establish an after-school club to educate and entertain children. 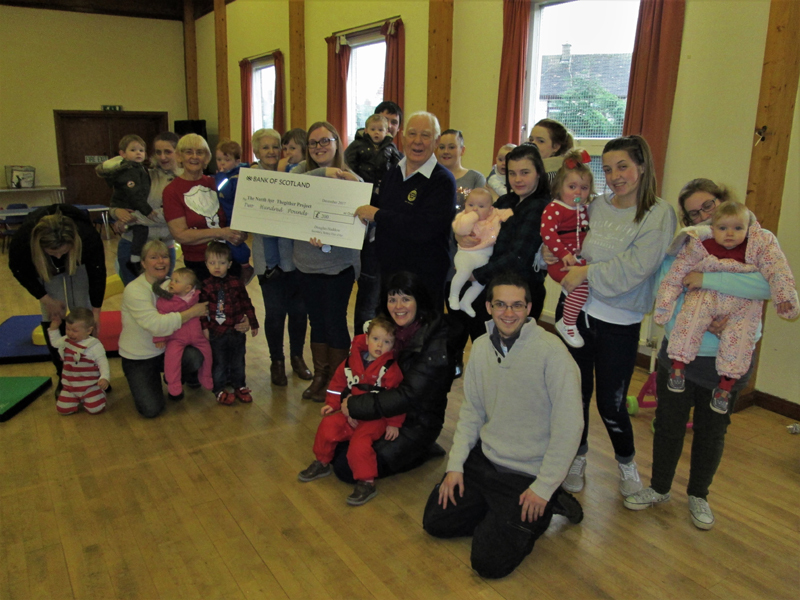 Mike Williams presented the cheque to Rosie at a gathering of the toddlers club in the Dalmilling Church hall.